Allen and I had a nice relaxing weekend. I was able to finish and wrap up both my spring exchanges. I would send them out, but I seemed to have forgotten packing materials. I will have to get that tomorrow. 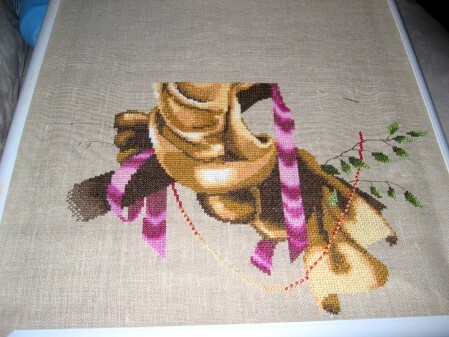 I also stitched a bunch on Woodland Fairy, finished the current part of Mystery 9 and stitched a bit on my lilies. We also watched Madagascar and Arabian Nights (a tv movie from a few years ago). Then we went to Outback for dinner. I had some yummy ribs:) Today we actually got some good cleaning done around the house…YEAH! Here is my progress on WF which I will hopefully work on a bunch tomorrow too!!! WF looks amazing, well done. Sounds like you had a wonderful weekend.